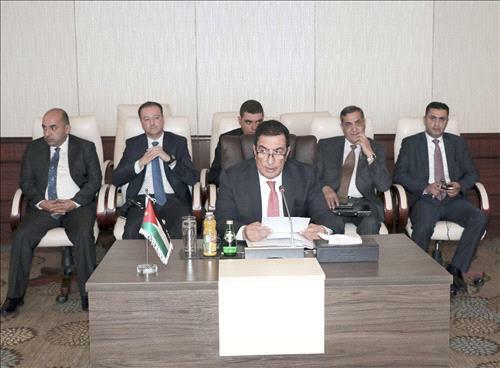 AMMONNEWS - Heads of parliament of Jordan, Cyprus and Greece on Monday emphasized the outcome of a trilateral summit, which was held between His Majesty King Abdullah II and the Cypriot and Greek presidents on Sunday, calling for expanding cooperation between the three countries. During the meeting which took place at the Dead Sea, the delegations urged support of the efforts of King Abdullah, Custodian of Islamic and Christian holy sites in occupied Jerusalem, to protect the sanctities and preserve the legal status quo in the city. They also voiced their support for a just and lasting solution to the Palestinian-Israeli conflict based on the two-state solution. The closing statement of today's meeting stressed the importance of the parliamentary cooperation as a base for shared principles to enhance cooperation between the governments of the three countries. The meeting discussed means to bolster cooperation in the fields of energy, tourism and education and culture. The three heads of parliament agreed to continue deliberating on issues for the common good to come up with a tangible outcome through joint procedures and initiatives, in addition to parliamentary cooperation and coordination in the international organizations. The meeting called for supporting efforts to resume negotiations on the Cypriot issue to reach a lasting solution acceptable by all parties.